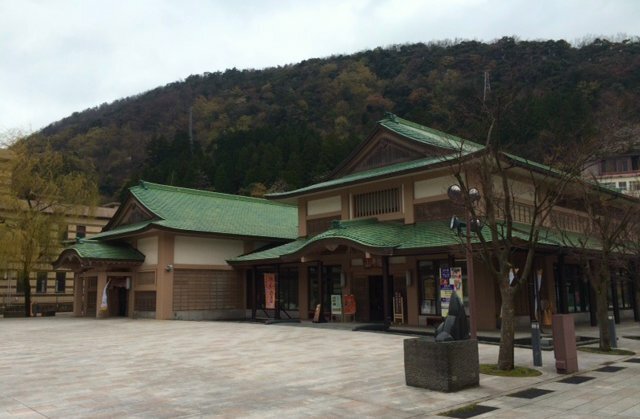 Yamanaka Onsen was deep in the mountains. It had rained and the road was damp and the mist clung to the peaks of the mountains. In the bottom of the gorge, a river followed the road in a series of undisciplined curves. It was a striking, mineral-rich green and flowed rapidly after the rain. A truss bridge stretched high across the river, triangular in section, violet in colour, describing a lazy S-shape. It led to a path through a park filled with cherry blossoms, and alongside the river, past a waterfall to a shrine and a 2,300 year-old cedar. Ryokans were clustered around the river on the edge of town. It was the middle of the morning and the main street was all but deserted. There were no customers in the old wooden stores. It was early, yet, for the sake brewery, the tea-house and the soba noodle shop; and there were no tourists, but me, to browse the shops which sold the lacquerware for which the region is famous. The town was built around hot springs and the two public bath houses, one for men and one for women, are centrepieces of the plaza. The waters, at a temperature of 48.3 degrees Celsius and rich in calcium and sodium sulphate, are said to relieve “muscular pain, joint pain, shoulder pain, bruises, chronic digestive diseases, haemorrhoids, over-sensitivity to cold, fatigue, arteriosclerosis, cuts, burns, chronic skin diseases and motor paralysis”. I slipped my trainers off and went in, only to be stopped at the door and made to understand through urgent, embarrassed gestures that the smaller building across the plaza was the men’s bath house. I had come unprepared, as ever, and had to hire a towel and buy a sachet of shower gel. There were lockers in the foyer for shoes and valuables and, with those locked away, I went through to the wood-panelled changing room and folded my clothes into a basket and slotted it onto the shelf. It is illegal to be untidy in Japan. It was a bright, spacious bath house with a pitched wooden ceiling and high windows running the length of the room. The walls and the floor were tiled in muted colours; there was a tiled pillar in the centre of the bath with a plinth you could sit on and lean your back against it. Around the edge, there were shower heads and mirrors set low. I took a plastic stool from the stack, sat down and showered, then padded across the room to the bath and slid into the hot water. The idea is to soak for a while, get out, shower off and soak again. I have no idea whether it does anything for the conditions it is said to relieve, but it is without doubt relaxing. There were a couple of locals bathing, perhaps connoisseurs but thankfully not acting with the physical abandon which Ian Burumu mentioned in the extract above. They politely ignored me and I politely ignored them. We had no language in common to gossip, in any case; and I was not going to scrub anyone’s back. I love the story! So well written. I know how your probably felt sitting in the bath tub not knowing if it does something for your body and not be able to speak with others. I’m sure it was a great experience.